This book was not published by Next Culture Press. This book is about feelings, and the ways that we, as individuals and as a culture, have numbed ourselves against them. It is about unleashing the possibility of conscious feelings to re-make our lives into what really matters to us. The Power of Conscious Feelings is so much more than a book of self-help or inspiration. Ultimately, it is about our connection with and responsibility for the fate of the Earth. When we are no longer numb, we are freed from solitary confinement in our private world of thoughts and beliefs. We emerge, already connected with other human beings, connected in the world of feelings we all have in common. Choosing numbness was probably unconscious for most of us. But Callahan is committed to showing us, step by step, in this moment, how we can change the mind and learn to consciously feel. "Just got the book - can't put it down. It's amazing and I've been crying since the first few pages - it's tough being an empath. Your words ring so true - thank you, thank you, for this stunning work!" "This book is nothing less than an encyclopedia of emotional healing, offering a "biblio-boot camp" of preparation for the collapse of industrial civilization and the Next Culture that might emerge from it. I highly recommend the book, and although I have not experienced any Next Culture trainings, they appear to complement all that I have written and taught about the inner transition necessary for navigating the coming chaos." 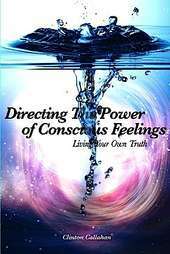 "The Power of Conscious Feelings is a book of enlightened distinctions; these distinctions changed my life: they changed the way I think and feel about myself and the world. This book maps higher consciousness and is a work of Conscience. I am an explorer of this territory. I recommend Clinton Callahan’s book whole-heartedly for its honor, insight, wisdom, and integrity. You can spend $10,000 on therapy or you can buy this book and change your life, which changes the world." "Living in the Middle East, in an area where conflict, war, and violence have been the norm for decades, one experiences numbness not only as a reaction to the feeling of hopelessness in achieving any solution to the conflict, but numbness for many has become a tactic for survival within itself. In this book, Callahan introduces individuals, communities and nations to the tools that allow for awakening and transformation to occur; to create opportunities that allow for all those who live in the Middle East to free ourselves from all things that do not allow for a future worth living and fighting for.